Order a package, receive it in 30 minutes or less. Sound too good to be true? Well Amazon doesn’t think so. 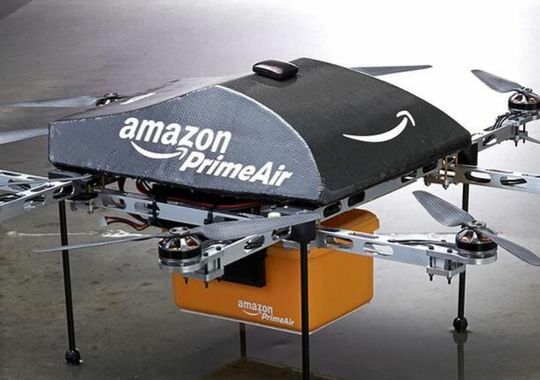 The largest Internet retailer in the world is planning to have packages shipped using drones, they are calling this new delivery system Amazon Prime Air. These aerial drones will be unmanned and can ship packages weighing up to 5 pounds (86% of their shipped out packages are 5 lbs or less), travel distances that are 10 miles or longer, at about 50 miles an hour. Even though Amazon believes their drones will change the world of shipping, they are having a difficult time getting support from the U.S. Federal Aviation Administration (FAA.) Paul Misener, Amazon’s vice-president for global public policy, says that if the U.S doesn’t start to take drone technology seriously, they will fall behind from the rest of the world. He claims that other countries have recognized the economic benefits of drones but, according to the Guardian, Amazon had to wait six months just for FAA approval to have outdoor testing. This permission came too late, since they already had new models developed that would need additional approval for testing. As with most prototypes, there are constant improvements needed to be made to create the best final product. Nonetheless, the FAA’s lack of support has slowed down the process of implementing Amazon Prime Air as a faster and more convenient shipping option for its loyal customers. The main concern of the FAA is safety – the drones need to prove that they can safely maneuver around other aircraft. Since there is no one on board the drones, we would solely depend on technology to avoid any accidents. This is perhaps the most difficult issue to get around, since many people don’t like the idea of robots flying around nearby where planes are flying. Despite the opposition from the FAA, Amazon decided to take things into their own hands. They employed a team of roboticists, software engineers, aeronautics experts and pioneers in remote sensing to test the drones in Canada – just a mere 2,000 feet from the U.S border. Amazon still sticks by their innovation and claims that these drones are not a threat to regular aviation because they operate in a “slice of virgin airspace – above 200ft, where most buildings end, and below 500ft, where general aviation begins.” They also claim that the drones are faster, safer, and more economically and environmentally friendly – and could potentially bring in over $14 billion in economic revenue during the first three years alone. The economic payoffs and pressure from Amazon should be enough to loosen up the FAA, but only time will tell if consumers will be able to benefit from Amazon Prime Air.